The Mauritanian Minister of Fisheries and Maritime Economy, Nani Ould Chrougha has spoken of a new impetus in cooperation between his country and Egypt. This will cover trade, fisheries, investment, processing plants, training, the development of fisheries products and scientific research. Ould Chrougha was speaking in Nouakchott on Tuesday at a meeting with Egypt’s Agriculture Minister, Abdel Mounim Al Benna who has been on a two-day visit to Mauritania. The meeting also included stakeholders in Mauritania’s fisheries sector and maritime economy. Relations between the two countries are “important for the development of our fisheries resources, through a partnership in investment and production” the Mauritanian minister emphasized. For his part, Mr. Benna insisted on the need to encourage investment in fisheries, increase value-added for fisheries products, train technical staff and ensure coordination between the Egyptian Naval Academy and its Mauritanian counterpart. During the meeting, some stakeholders in the fisheries sector and officials of the National Federation of Fisheries insisted on the importance of cooperation between the two countries. 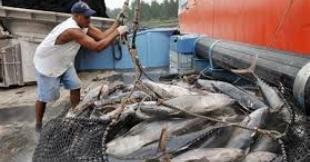 They spoke about opening up the Egyptian market for the fisheries sector in Mauritania.